Carnaby Street and the surrounding Newburgh Quarter is one of my favourite spots in London. Popular with the stars of the 60s and 70s, mod icons such as Paul Weller and the The Who could often be found picking up their clobber in Merc and Lord John, Carnaby is still the place to be 50 years down the line. Whether you're shopping, eating or drinking, this 3-block cobbled street and the surrounding narrow avenues have everything you need on a smaller, calmer scale than the hustle and bustle of nearby Oxford Street. While kids and tourists elbow their way through the crowds to pick up the latest Primark and New Look atrocities on England's busiest high-street, Londoners in the know are smugly strolling down Carnaby Street lapping up the unmistakeable British culture as well as the finest threads and most delicious grub on offer. 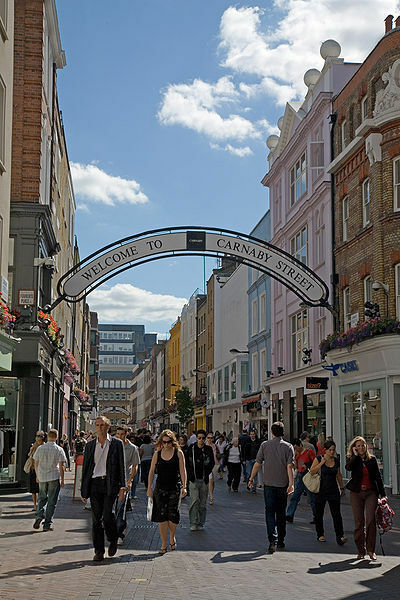 There has always been an obvious link between music and Carnaby; most recently emphasised by the opening of London's first Pretty Green store – the clothing line headed by former Oasis frontman, Liam Gallagher. As a relatively new brand, the store has only been there for 2 years but has already settled in, cementing its place a few doors down from more established British labels including Ben Sherman and Merc. Carnaby Street was obviously a preferred choice for Gallagher given its heritage and association with so many of his musical heroes. Classic British brands such as Fred Perry and Ben Sherman have, in recent times, also been joined by more contemporary but equally trendy neighbours from overseas including The Kooples (French) and Cheap Monday – a Swedish denim company that make some of the best jeans available (a bold statement considering Levi's can also be found here). High street shops like Office and Jack Wills maintain the balance and perched on the end is Soccer Scene – arguably the best London outlet for all your footballing needs. I remember being taken up there as a youngster because it was the only place that sold the latest Inter Milan kit in kids' sizes… You get the idea. When the stomach starts to rumble after a hard day of dawdling, there is a plethora of cafés, bars and restaurants at your disposal; surely none better than 'The Diner'. This touch of America in the midst of its typically British surroundings serves up some of the finest burgers, steaks and sarnies - as well as some fairly hefty portions of chips - this side of Shoreditch (there is another one near Liverpool St). Wash it all down with a few early evening ales in the traditional Red Lion pub and there you have a perfect day of shopping, fooding and drinking within the space of a few hundred yards; and more importantly without the queues and the jostling, the likes of which you encounter on the inexplicably popular Oxford Street.